A big satire about the state of the nation - or rather the capital of the nation - 2008. Lanchester is a first rate journalist, with a great eye for the nuances of social hierarchy, and in this he is akin to Tom Wolfe. 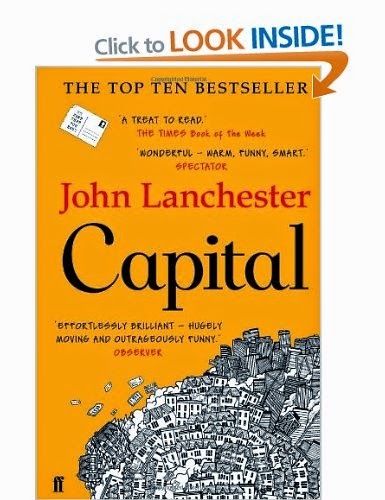 Capital is Tom Wolfe Mild, or perhaps - and there's a kind of irony in this, given the novel's emphasis on the cosmopolitan nature of London's population (unmatched anywhere in the world, NY included) - Tom Wolfe Englished. He follows the line Wolfe takes in his masterpiece Back to Blood, about Miami, in weaving his book out of multiple narrative strands. Lanchester does not take on the big boys, as Wolfe does, instead concentrating on discreeter lives (although that perhaps does not include a vague representation of Banksy or the narrative that includes being arrested under suspicion of complicity of a terrorist plot to blow up the Channel Tunnel). It is an enjoyable book, but what begins as a piece of social commentary becomes chained to its unlikely plots, and for Wolfe-o-philes it is frustrating that Lanchester's cartoon characters (meant in the best possible, Wolfian,way) are not quite funny or engaging enough to make the book as greed-inducing as the Master's. A good 7 out of 10, and may well be of use 100 years hence, to social historians if not to literary critics (if such persons still exist of course). Labels: Lanchester, London, novel, Tom Wolfe.